Dr. Dianne Lynch is the president of Stephens College, a women’s college in Columbia, MO, which was founded in 1833. As president of one of the oldest women’s colleges in the country, Lynch is a strong advocate for women’s leadership and education and is known for her commitment to students. Dr. Lynch previously served as dean of the Roy H. Park School of Communications at Ithaca College (in Ithaca, New York). She is a former Fulbright Senior Specialist in new media technologies and learning; a member of the national accrediting council for schools of journalism and mass communication; and a member of the national Journalism Advisory Council of the John S. and James L. Knight Foundation. 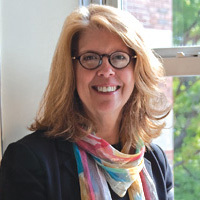 Prior to becoming dean at Ithaca College in 2004, Dr. Lynch was a faculty member and chair of the Department of Journalism at Saint Michael’s College in Burlington, Vermont, a private liberal arts college. Dr. Lynch was the founding executive director of the national Online News Association. In that capacity, she was the editorial director of the first national study of the credibility of online news. She wrote a biweekly column about women and technology, “Wired Women,” for ABCNews.com from 2000 to 2003, and a weekly column on new media ethics for the Christian Science Monitor from 1998 to 2002. Dr. Lynch earned her B.A. and M.A. from the University of Wisconsin-Madison, studying mass communication and feminist history in journalism, and her Ph.D. in Art History and Communications from McGill University in Montreal, Canada, where she studied feminist theory and social identity development. Her research focuses on the learning styles and knowledge production of “digital natives,” children who grow up in virtual environments. In 2013, Lynch was commissioned by the John S. and James L. Knight Foundation to produce a white paper on the future of American journalism and journalism education.